Film Premiere of a short documentary about Western New York families affected by hydrofracking: “WNY Frack Chat”. Informative presentations about how high-volume fracking in NYS could affect WNY. Pizza, soda and beer included! 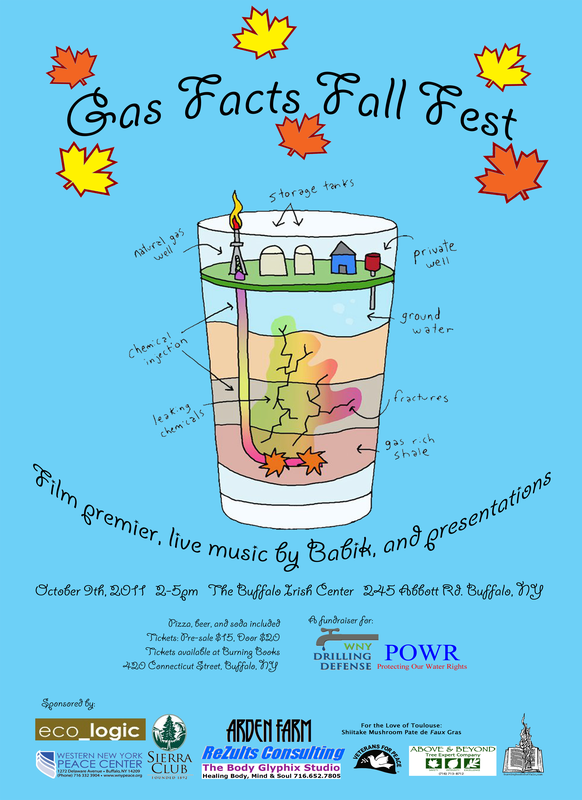 This is a fundraiser for WNY Drilling Defense and Protecting Our Water Rights (POWR), two local grassroots environmental groups. Tickets: $15 pre-sale, $20 at the door. Tickets available at Burning Books 420 Connecticut St, Buffalo, NY. See http://www.burningbooksbuffalo.com for hours. Cosponsored By: WNY Peace Center, Veterans for Peace, Sierra Club Niagara Chapter, Arden Farm, Above & Beyond Tree Expert Company, Rezults Consulting, Body Glyphix Yoga Studio, For the Love of Toulouse: Shiitake Mushroom Pate de Faux Gras, Eco-logic Studio, Burning Books and Peace Education Fund. This entry was posted in hydrofracking, marcellus shale and tagged festival, fundraiser, hydrofracking, Protecting Our Water Rights, WNY drilling defense. Bookmark the permalink.